This has been an exciting week! On August 25, shortly after 5:00 pm, I welcomed my third grandchild into this world. She came in strong and healthy, and instantly deemed a princess by all awaiting her arrival! Presleigh Grace is truly our gift from heaven! My son, George, and his beautiful bride, Janelle, had elected to experience what the hospital called 'the golden hour'. This was a time of bonding for mommy and baby, dedicated to skin on skin contact, learning to nurse, and a quiet time for the new parents. Knowing this ahead of time, I asked my son to please send us a picture to see during that long hour of waiting. As an expectant 'grandmother', that hour seemed like five! What our kids didn't know, as the delivery was taking place, was that we were all hovered at the door, listening for that first cry, crying together, laughing and enjoying those first moments of being new grandparents, together. It was a wonderful, wonderful experience! While everyone else decided to head down and grab some dinner while we waited, I chose to stay behind. I just stared at that first picture and felt a sense of pride, love, and dedication to the new life the Lord had given us. I sat and shared the picture with my two closest friends via text, who had known my son for most of his life. I too a moment to consider the fact that my George was now a father, at 26 years old. I thought of what an amazing daddy he will be, too. Janelle's father, Joe, walked into the room. I watched every second as though it was in slow motion. He walked up to his daughter, needing to confirm that she was ok. I watched as he gently laid his hand upon her shoulder, then on the baby, and lightly stroked both. I watched as he smiled from ear to ear. 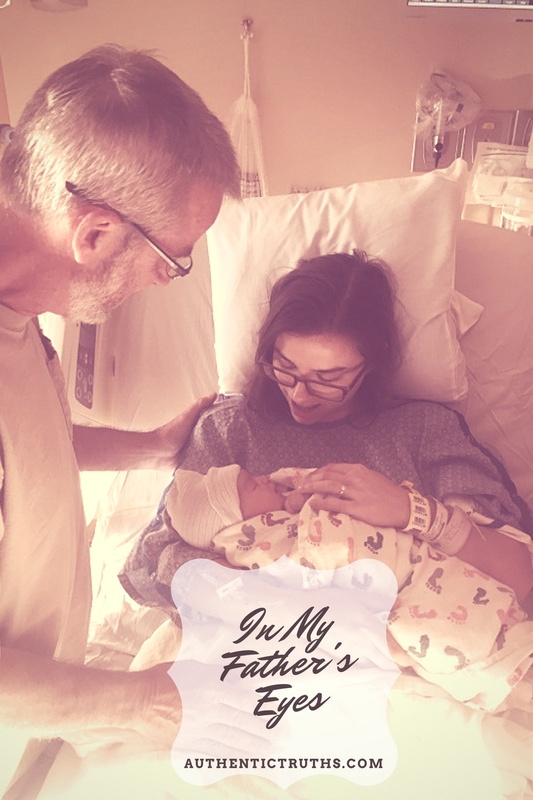 It was a deeply profound moment to watch a daddy look at his baby girl, now a mother, and experience that deep connection for myself. As we began the ritual of taking more pictures than we can count, I noticed one thing..
Papa Joe never took his hand off his daughter, or his eyes of his first grandbaby. I couldn't stop thinking about it all night, how blessed and honored I was to witness a father's love in one of life's greatest moments. See, I had no father. I had no daddy to rush to my side to see if I was ok. I had no daddy to share in moments of graduation, or marriage, or becoming a mother for the first time. I've seen a few moments throughout my life of 'daddy-daughter' times, but this one stood out for me. For what I saw that particular night was exactly how I imagine my Father in heaven loving me. Always having one hand holding me, and his eyes always upon me. While I compared that picture of Presleigh to her daddy, my son, I will forever compare that moment of watching Joe with his daughter, to my Father above, loving me. This was an unexpected message, delivered at the perfect time in my life. A reminder of my Papa's sweet, tender and complete love. In the midst of our own elation over the birth of this new perfect child, I was profoundly impacted by a father's perfect love for his own beautiful, grown child. I now comprehend something about my own relationship with God that I may never have truly understood before. If our mission in life is to Know Jesus, and Love Like Him, I'd say I witnessed that in a rare and special gift right there in the middle of a hospital delivery room. It was a priceless jewel deposited in my memory bank, and one I will never forget. Glory to God, and thank you Papa Joe.